Oh my goodness, I’m in ice cream heaven and I’m not a huge ice cream fan but Graeter’s ice cream has won me over. Graeter’s small batch, French pot Black Cherry Chocolate Chip is ADDICTIVE. 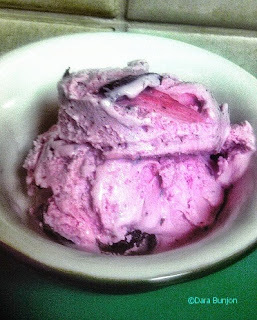 It all started when their public relations person asked if I would be interested in sampling and writing about Graeter’s newest flavor in three years, Black Cherry Chocolate Chip. Being a Ben and Jerry’s Cherry Garcia fan I was curious to see how this stacked up. Six pints arrive, all Black Cherry Chocolate Chip and immediately go into my freezer. Their label states “irresistible” and like the Borg in Star Trek, my resistance was futile and I grabbed a spoon and dug into a container, just for a taste. The creaminess, rich bold flavors and textures had me hooked. Before I knew it that one spoonful turned into almost half the pint and by the evening’s end, I had finished the whole container..
Read my review and check out the snaps HERE.